The outgoing United Nations envoy for war-torn Yemen on Tuesday urged the warring parties to stop fighting and bloodshed to give peace a chance in the country, plunged because of a “destructive pattern of zero-sum politics into ever deeper poverty and desolation”. 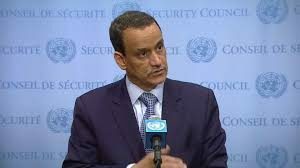 Ismail Ould Cheikh Ahmed, who was briefing the Security Council on the eve of his stepping down at the end of the month, emphasized that while the UN and the wider international community can try to bring about a favorable environment for a path to peace, Yemeni decision-makers must stop the fighting and bloodshed. “Conflict has gradually destroyed the economy, healthcare services, housing, roads and schools – everything that Yemenis need in order to live and prosper,” he said, calling on the parties to cease hostilities, reactivate negotiations aimed at a peaceful settlement. As the conflict deepened, so did the socio-economic misery, making Yemen the world’s largest man-made humanitarian crisis, which has claimed thousands of lives and driven many times more from their homes, he deplored. He recalled that across the country, more than three-fourths of the population – over 22 million persons – are in need of humanitarian assistance, including more than 8.4 million who are severely food-insecure. “Prices of essential commodities in the country have skyrocketed, the value of the currency has dwindled, salaries have not been paid in months and in some cases, years, and the country’s health, water and sanitation, basic services and education system are in tatters, with money which could have been used to maintain such services and stimulate economy being used to fund the war,” he stated further. The UN Special Envoy noted that a roadmap for peace in Yemen exists but the parties to the conflict need to build confidence among themselves and launch it. “The only part missing is the commitment of parties to make concessions and give priority to the national interest,” he concluded. Ismail Ould Cheikh Ahmed will be replaced by Martin Griffiths, a seasoned former diplomat and humanitarian worker. John Ging, Director of Operations at the UN Office for Coordination of Humanitarian Affairs (OCHA) who also briefed the Security Council on the situation in Yemen echoed Ismail Ould Cheikh Ahmed, underscoring that an end to hostilities and “meaningful” engagement of the parties is vital to ensure a lasting political solution. However, until that happens, humanitarian response is critical to save lives, he said. “Securing full funding for the $2.96 billion Yemen Humanitarian Response Plan is a top priority,” he said, noting that the Central Emergency Response Fund recently allocated $50 million to humanitarian efforts in the country. Posted by Jaber Ali on Feb 28 2018. Filed under Gulf News, Headlines, World News. You can follow any responses to this entry through the RSS 2.0. Both comments and pings are currently closed.